Through the centuries, architects have used small construction projects to experiment with spaces of limited form, scale and extent, but also with material and details. As there’s a lack of well-equipped research laboratories, the research of material by architects focuses on the potential of existing (construction-) products, for possibilities of improper use of materials. Netherlands-based Hoogte Twee have designed a temporary pavilion for such an experiment. 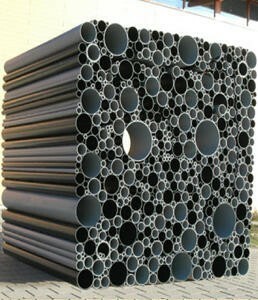 PVC tubes have inspired them to design a special object in which this material is no longer seen as a tube but as a hollow building block. The material is studied for its spatial characteristics and defies its standard application. The transparency in the lateral-direction and the fixed wall across determine the spatiality.By parallel stacking the tubes as building blocks, a mass has been created which represents itself closed on four sides, but which is transparent, seen from the narrow sides. By hollowing out this mass, a special residence will be created which will be provided with light from the narrow sides.